Our Safety Baskets capture debris so that it can be easily discarded. They are dishwasher-safe to allow for easy cleaning. Need help sizing? Download our printable sizing template. 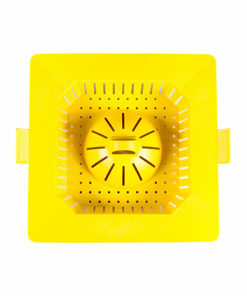 The PermaDrain Safety Basket is an easily seen, bright yellow floor sink basket. 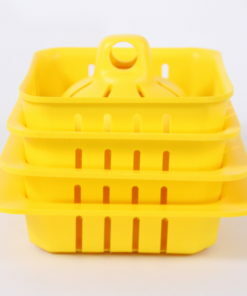 PermaDrain Safety Baskets are the first to feature a center handle above the outside rim and waterline. 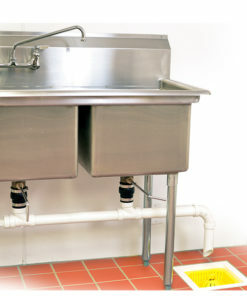 Therefore, kitchen staff can easily remove the Safety Basket while keeping their hands clean and safe. Business owners often find floor sink baskets in the waste bin or dumpster, but not PermaDrain Safety Baskets. Kitchen staff will trash anything that makes their job harder. Our Safety Baskets make cleanup easier on employees. 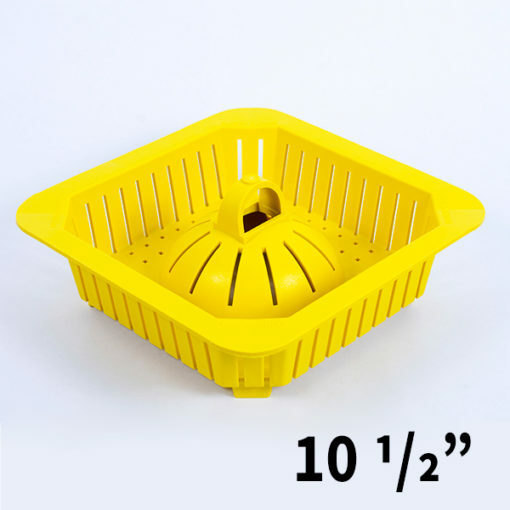 PermaDrain Safety Baskets feature drainage slots surrounding the outer edge. 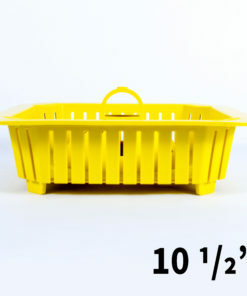 Therefore, liquids drain immediately regardless of debris inside the basket. 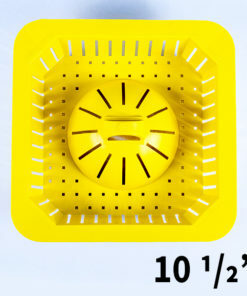 Our Large Safety Baskets range in size from 8″ to 10 1/2″, guaranteeing a perfect fit for any floor sink. All PermaDrain Safety Baskets are constructed of a heat, impact, and chemical resistant poly-alloy material. 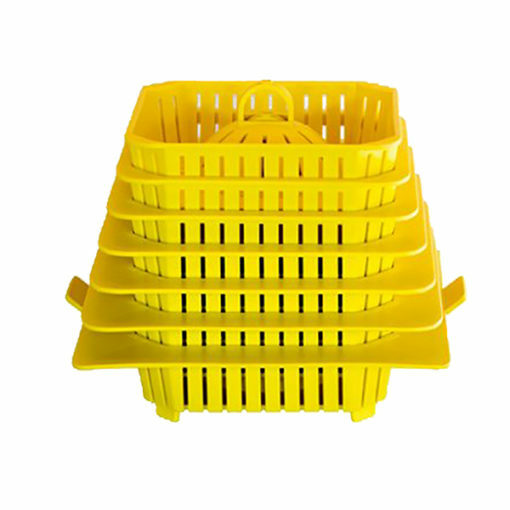 Our Safety Baskets will not degrade under high temperature, therefore, they work great under steam kettles and dishwashers. 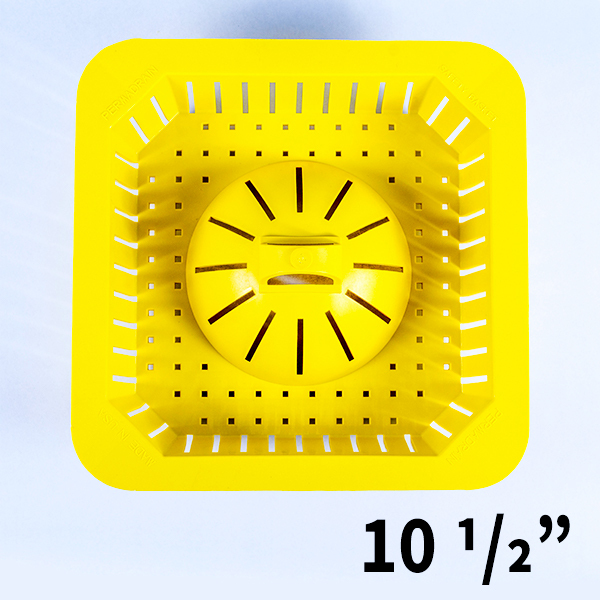 Safety Baskets work best when used with our Locking Dome-Strainer Kit. 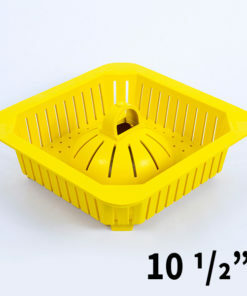 Our Safety Baskets feature a domed design to create the perfect fit with our Locking Dome Strainer. Using our Safety Basket with our Locking Dome Strainer keeps finer debris from reaching the dome strainer. 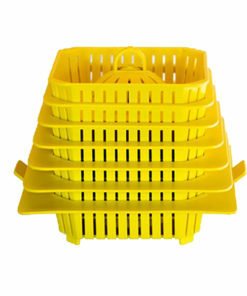 Our Large Safety Baskets are able to strain fine debris as small as rice. Small food particles will accumulate in P traps over time. Service professionals may need to shop vac drains, resulting in lost time and money. 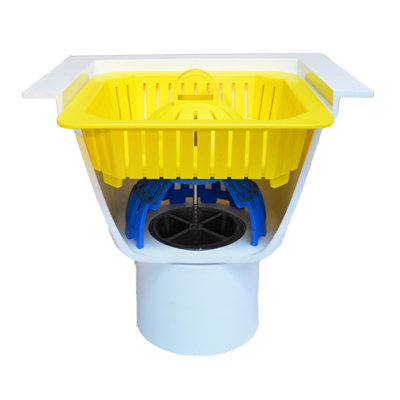 Most importantly, our Locking Dome Strainer and Safety Basket System provides complete protection against foreign debris. At the end of a shift, kitchen staff usually hose down floors and squeegee standing water toward floor drains and floor sinks. So, your floor sinks are at high risk of receiving silverware, ramekins, and other debris. 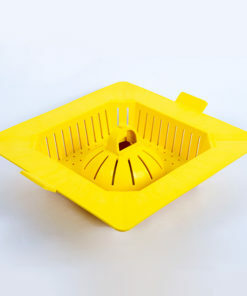 With PermaDrain’s floor sink basket protecting your drains, employees can continue to clean up this way without the risk of clogging your drains. Lastly, your employees bad practices will no longer harm your business. 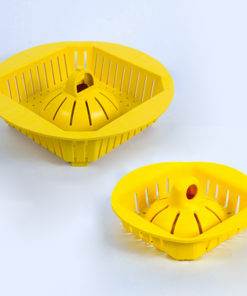 PermaDrain’s floor sink basket provides an easy, quick, and clean way to discard food and foreign debris. 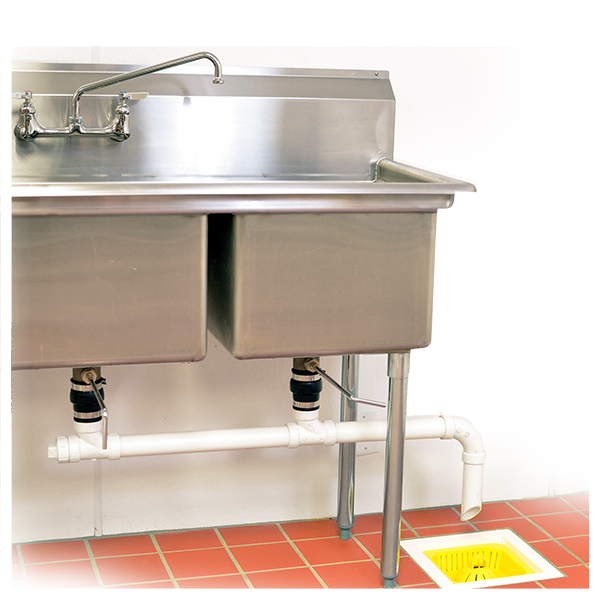 Click here to see our Safety Baskets and other PermaDrain products in action. 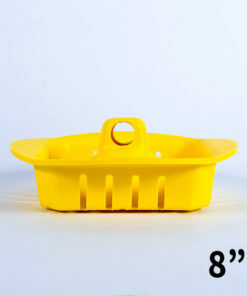 8 ½”, 8", 9 ½”, 9", 10 ½”, 10"
Fits any square floor sink measuring between 6 and 10 ¾ inches on the inside. 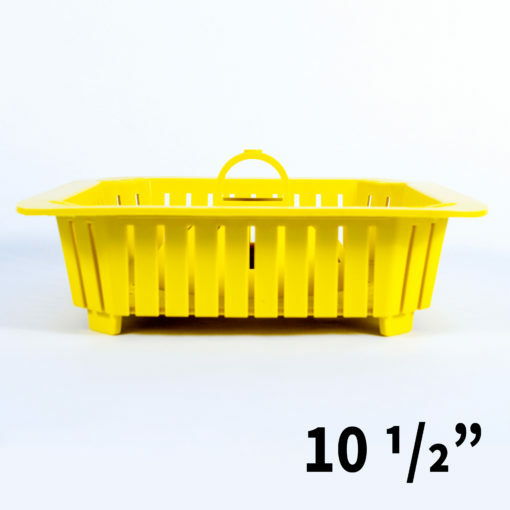 Over 90 percent of PVC floor sinks will use a 9” basket. For best results, we recommend cleaning all debris from p-traps and drain lines prior to installation by a certified plumbing or maintenance technician.